The Whisper 500 quality cheap wind generators performs well in harsh, high wind environments with its two-bladed, fiberglass-reinforced design. Patented side furling over speed protection optimizes output at any wind speed. Assuming a 12 mph (5.4 m/s) wind, a Whisper 500 will produce as much as 500 kWh per month. That is enough energy to power the about half the needs of average California home. Tower kit sold separately. The Whisper wind 500 is rated at 3000 watts in 28 mph average wind speed. Available in 48 volts, the Whisper 500 has been installed all over the world and has an excellent field record. With a blade diameter of 15 ft., the Whisper wind 500 mounts on standard 5″ #40 pipe. There are tower kits available for 47 ft. and 70 ft. The higher the tower, the higher the general wind speed available to the wind generator. The power of wind increases 8 fold if you double the wind speed. 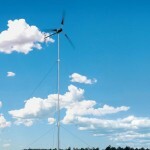 The “cube” rule provides the best way to maximize performance: put your wind generator as high as you can. The Whisper 500 includes the EZwire system which contains all the fuses, meters, and AC/DC safety disconnects already pre-wired and ready to go. This speeds installation and increases safety. This assembly easily expands in capacity by adding solar PV panels. Wind and solar give a nice charging profile, as usually one or the other is stronger at a given time. Used together, they offer the battery bank more steady charging. This system is a work horse, and qualifies for CA rebates!